Albert Camus was a French author and philosopher born on November 7, 1913 in French Algeria to a poor agricultural worker, Lucien Auguste Camus, who died in the Battle of the Marne in 1914, and to Catherine Marie Cardona, a house keeper of Spanish descent. After the death of his father, Camus, his mother and brother lived under meager and difficult conditions until he was awarded a scholarship to attend high school at the Grand Lycée. It was there during his high school years that Camus became an avid reader of Gide, Proust, and Verlaine, among others and learned Latin and English. In 1933 Camus enrolled at the University of Algiers to pursue his diplome d’études superieures, specializing in philosophy, while also obtaining certificates in sociology and psychology. His graduate thesis at the University of Algiers explored the relationship between Greek philosophy and Christianity, specifically the relationship of Plotinus to Augustine. Although he did not consider himself a philosopher and actually opposed systematic philosophy, Camus' views helped give rise to the philosophy known as absurdism. He was also linked with Sartre and existentialism due to his belief of individual freedom, however he rejected the label stating: "No, I am not an existentialist. Sartre and I are always surprised to see our names linked…"
Camus' most important work contributing to the theme of 'absurdity' in philosophy is The Myth of Sisyphus. Human existence, according to Camus, is absurd. This absurdity derives from our attempts to make sense of a senseless world. He tells us "the absurd is born of the confrontation between human need and the unreasonable silence of the world." For Camus 'absurd' is that which arises out of a comparison of the ridiculous with the sublime, such as the fate of Sisyphus who was condemned by the gods to eternally push a boulder up a hill only to have it roll back down again after he reached the top. For Camus, Sisyphus' fate aptly demonstrates the futility and hopelessness of labor. We, like Sisyphus, live our lives accomplishing nothing. Everything we seem to accomplish, are committed to, or inspired by, is destined to extinction when the universe ultimately collapses. Why then, in such a pointless existence and irrational universe "should I not commit suicide?" asks Camus. He considered the question one that existentialist philosophers such as Kierkegaard and Sartre failed to both ask and answer. He states that they failed to stick with the original premise of their philosophy which is that the absurd is a consequence of the encounter between a rational human being in an irrational world. 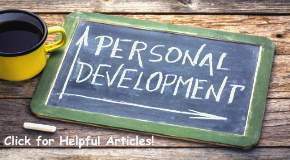 Instead, they each made an attempt to resolve the conflict which is irresolvable because it is a given of human existence. To try to resolve it is to deny the very phenomenon one began with. For Camus, suicide is merely another attempt at resolving it. The answer, according to Camus, is therefore to accept, like Sisyphus, the fully conscious experience of being alive. In the face of the absurd we must metaphorically 'revolt.' Revolt is the awareness of an inevitable fate, but without the resignation that might accompany it. We must imagine Sisyphus happy for 'being aware of one's life to the maximum… and is living to the maximum…' Thus, Camus rejects suicide as an option, for we cannot solve the problem of the absurd by negating its existence. It is a necessary state of the conflict between man and his world. 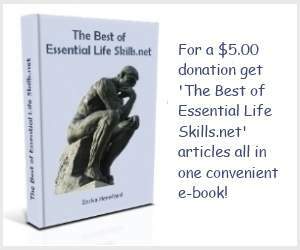 Suicide would be a defeat and a denial of the very condition of man's existence. The paradox in what Camus calls the absurd is that existence itself has no meaning so we must learn to bear irresolvable emptiness. Like Sisyphus, we cannot help to continue to ask about the meaning of life, only to see our answers topple back down, however, we can arrive at meaning and purpose by making it for ourselves. It is the individual, not the act, that gives meaning to any context. 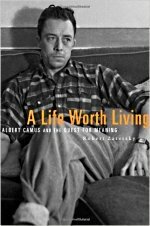 Although Albert Camus was not technically a philosopher by training or profession, his numerous literary works, essays and speeches made significant contributions to a broad range of issues in moral and political philosophy. 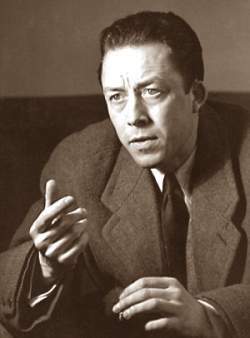 The Nobel committee, in awarding him the prize for literature in 1957, stated that Camus' efforts "illuminate the problem of the human conscience in our time." Sadly, Albert Camus was at the height of his career when he died tragically in an automobile accident in Villeblevin, France on January,4 1960.